Spring rolls, so named because they’re traditionally served on the first day of the Chinese New Year (in early spring), are smaller, more delicate versions of the egg roll. Chinese New Year is the grandest and the most important festival for Chinese people. This spring festival, which celebrates family reunion, is full of rich and colorful activities, and hopes with the advent of spring and flowers blossoming. Wash and chop your vegetables of choice into thin sticks or pieces (we recommend whatever is most colorful and in season, but carrots, cucumbers, sugar snap peas and radishes are some possibilities). Combine all vegetables in a bowl and season with salt and pepper, to taste. 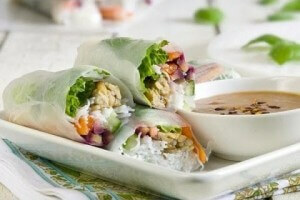 One by one, soften your RICE PAPER SPRING ROLL WRAPPERS by immersing them in warm water for about 1-2 minutes. Place your wet spring roll wrapper on a flat surface. Put a tower of vegetables (about 1 large spoonful) in the bottom third of the wrapper. Fold bottom of the wrapper over the ingredients, then fold in the sides tightly, then roll it closed. Place minced garlic and/or ginger in a jar (you decide how much). Add the rest of the ingredients below, tighten the lid and take turns shaking.